The ball is angling away from you. While you can take different directions to intercept it, you want to hit the ball back with some power and not simply run over and touch it or just stop it. You've heard often enough that moving into the ball gives you power, that is getting your body's momentum behind the stroke and into the ball equals power. Why doesn't that happen often enough for you? Because if you either move parallel to the baseline, turn sideways, or pivot one foot to the side, you're moving away from the ball and not into it. It's simple geometry. To see this, imagine you're ready to throw a tennis ball at a friend's car going past you parallel to the sidewalk on which you're standing (1B). If you throw the ball before the car is at a right angle to your position, you're throwing the ball INTO the car and it hits with force. If you throw after the car passes the right angle mark, the ball's moving AWAY with the car and catches up with it later, hitting with less impact. Let's apply this to tennis. 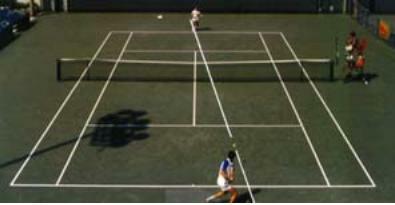 You're in the ready position behind the baseline and a ball is hit to your left side (1C). Draw a line from your position to form a right angle to the ball's flight line. If your movement pattern takes you to the inside of that right angle mark, that is in the direction of the net, you're moving forward and INTO the ball. And your ever-so-important momentum is going into the ball, which means power. Diagram 1C shows that by moving parallel to the baseline you're moving away with the ball, catching up to it later. As a result your momentum is going off toward the side fence and not into the ball, it takes more time to reach it, and there's little chance your body can structure itself to support your contact spot because the ball has passed you by. I know you feel you don't have enough time in which to hit the ball, but you can't give yourself more time to hit it by taking more time to reach it because the ball is angling away from you and getting lower. In what direction lies forward? To one side? Into the ball? Diagram 1D explains. You want to move into the ball, you want your momentum into the ball. The angle of your movement relative to the ball's flight line helps you reach the ball on time, Step 2, structure the body for a strong hit, Step 3, and helps you develop power in a simple manner and not in one you're used to that is counterproductive to success, Step 4. With your ready position three to five feet behind the baseline, moving into the ball means moving forward. But this idea of moving forward won't happen if you first pivot one foot against the ground, turn sideways, or step backwards as diagram 1E shows because, undeniably, the ball's moving away from you. Less is more. Roll the mouse over 1E to see the starting position for each. The following photos I took at UCLA during one of their meets illustrate how the ball angles away from every player, and how often even good players fail to move forward into the ball. The angle of possibilities is shown in the following two photos. 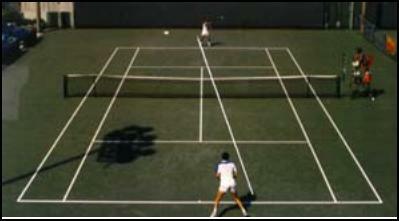 The background player strikes a forehand just barely from the right side of his court, and the foreground player is to the right of his center. The line illustrates the ball's eventual path, how it will angle away from the foreground player. In the second photo you can see how the foreground player has taken one step very backwards with his back foot even though he winds up moving forward to hit the shot inside the baseline. Why did he move back first? Training. It's clear you need to move forward, into the ball, and not waste time or opportunity by pivoting against the ground or turning sideways. How should the feet move to achieve this? Which one first? Step 2 explains.